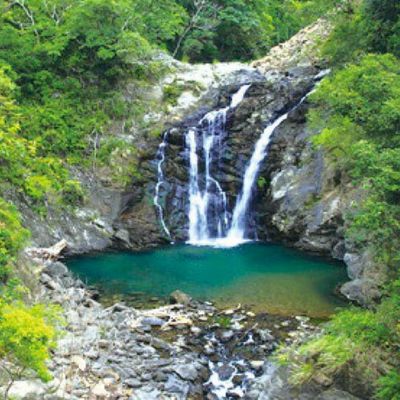 Situated in Lion Township of Pingtung County, Shuangliu National Forest Recreation Area is nestled among the mountains near Shoka on Southern Cross-Island Highway. This area ranges from 150 to 700 meters above sea level, spans 1596 hectares, and has a mean annual temperature of 21 ºC. Although the area is situated in a tropical climate zone, there is usually a cool breeze due to the dense forest and numerous rivers. This is one of the best low-elevation forest bathing areas in southern Taiwan. As part of Hengchun Hill, the complex landscape has hilly terrains, scattered mountains ridges, and valleys, of which the central valley is the lowest area. Fenggan, Neiwen and Daren Creeks pass through this area. These three flows bring heavy humidity, creating complex forests. There are streams, waterfalls, and hot springs in Fenggan Creek. The Shuangliu Waterfall, located at 3.6 kilometers from the entrance, washes down plenty of water, and the surface looks like a white fan. The water flows from woody rock cliffs to a deep water pit, resulting in an environment full of water vapor. Many visitors to Shuangliu come to visit the famous falls. Hat Mountain at the southern tip has highest peak here, and is accessible by a 2750-meter winding trail. The view from the peak is excellent and even may be the best; visitors can view the surrounding mountains, the Pacific, and the Taiwan Strait.